Takenaka Jinya (竹中陣屋) is the ruins of the house of Takenaka clan. It was small castle built by Takenaka Shigekado, the son of Takenaka Hambei Shigeharu, in 1588. There are moat, gates and stone walls remains. 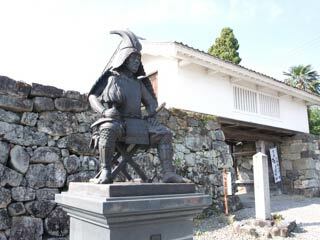 The statue of Takenaka Hambei is placed in front of the gate. After the battle of Sekigahara, because Shigekado joined the army of Ieyasu, Togun, he was given 6000 goku of this area. Takenaka Hambei Shigeharu is one of the most famous strategist during Sengoku Period. He served Hideyoshi and helped his success.